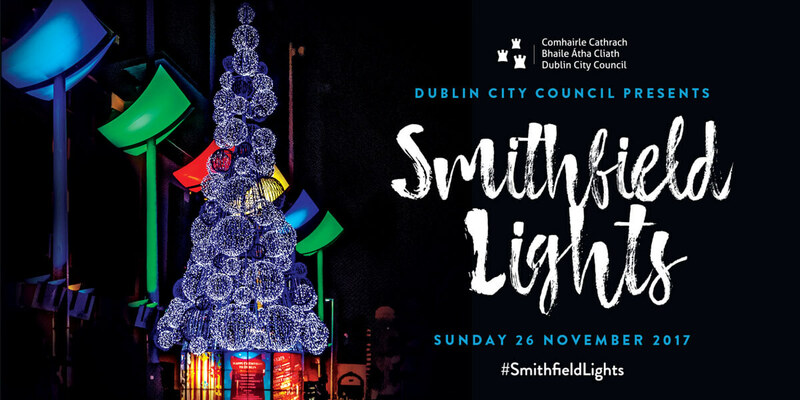 The 2017 Smithfield Lights was back on the 26th of November and was bigger than ever. This family Christmas event was attended by a multitude of families looking for an evening of fun and festive entertainment. Up to 2,000 people enjoyed a wide range of entertainments including face painting, workshops, a vintage carousel and an outdoor screening of the classic Christmas movie, The Snowman. There were market stalls with a delicious range of foods, arts and crafts. The main tree lighting event took place at 7.00pm. The Lord Mayor and special guests were in attendance. The event was presented by broadcaster Andrea Hayes and featured music from the Stanhope Street Girls Choir, Red Empire and headline act The Riptide Movement.